Lynne Graham lives in Northern Ireland and has been a keen romance reader since her teens. Happily married, Lynne has five children. Her eldest is her only natural child. Her other children, who are every bit as dear to her heart, are adopted. The family has a variety of pets, and Lynne loves gardening, cooking, collecting all sorts and is crazy about every aspect of Christmas. Ella Palmer has neither the money nor the connections to warrant the interest of Nikolai Drakos's archenemy. Yet the unassuming beauty has done just that—and claiming her will be Nikolai's ultimate satisfaction! The ruthless tycoon will use any means necessary to ensure Ella's compliance, so he buys out her family's debts. Debts he'll forgive if Ella becomes his mistress. But when he discovers the true extent of her innocence, Nikolai is forced to consider something new; it appears the indomitable Greek is about to take a bride! 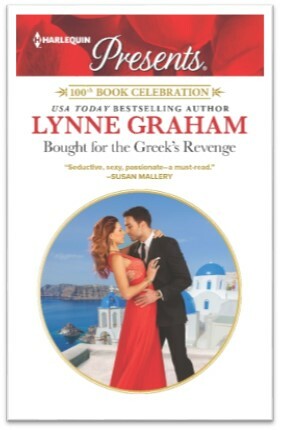 Congratulations, Lynne Graham, on OVER 35 MILLION copies sold worldwide with Harlequin! ‘Mistress,’ Nikolai slotted in cool as ice. Shock had welded Ella’s tongue to the roof of her mouth because he was sexually propositioning her and nothing could have prepared her for that. She wasn’t drop-dead gorgeous… he was! Male heads didn’t swivel when Ella walked down the street because she had neither the length of leg nor the curves usually deemed necessary to attract such attention. Why on earth could he be making her such an offer? ‘If you live with me I won’t be a stranger for long,’ Nikolai pointed out with monumental calm. And the very sound of that inhuman calm and cool forced her to flip round and settle distraught eyes on his lean darkly handsome face. ‘But it’s a crazy idea!’ she gasped. Nikolai sent her a gleaming sideways glance. ‘No the real cheat was you kissing me the way you did last year and then saying no and acting as if I had grossly insulted you,’ he murmured with lethal quietness. ‘You did insult me!’ Ella flung back, her cheeks hot as fire while she wondered if her refusal that night had started off his whole chain reaction. What else could possibly be driving him? I want to find out what is going to make him want to marry her. 100 books for Harlequin by Lynne! !